I have the privilege of living and working in Wellington. I also work in Sydney. In fact, my work can take me anywhere as long as I have a decent internet connection. My work style is a reflection of the modern workforce – highly mobile, with various interests and opportunities for work – but we have to be connected 24 hours a day, 7 days a week. However it is not an understatement to say that the forces currently influencing today’s workforce will change what it means to work and live. 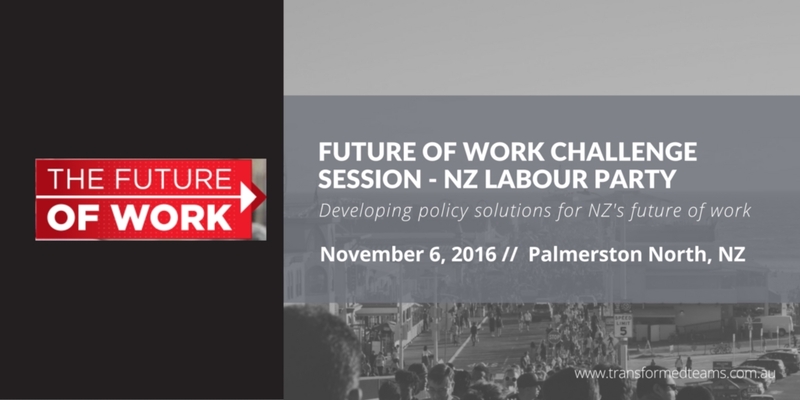 This blog extends the advice given to the New Zealand Labour Party Conference on November 7, 2015 about the future of work, with more ideas that time didn’t allow. The capacity for disruption, volatility and uncertainty in the workforce is greater than ever. Let’s take a look at some of the realities that shape the emerging picture of the future of work. Globally, the workforce is shifting towards micro-businesses with a global presence, greater mobile working and a larger degree of online working. 1.3 billion people globally are now mobile workers, up from 900 million in 2008. Internet-enabled devices have enabled this huge upswing: we now have the capacity to be locally and globally networked like never before. Flexible work styles are in high demand – 43% of employees globally would choose to forsake a precious pay-rise if they could work flexibly. The role and structure of organisations is changing. Phil Ruthven at IBISWorld recently predicted that by the second half of this century the term ‘employee’ will be out of vogue. ‘Jobs’ are being replaced by contracts. Contractors will organise themselves into clusters that come together and move apart for various pieces of work. There is a declining need for generalist middle managers. Technology can now monitor performance, provide instant feedback and create reports and presentations. So what does a middle manager need to do? Gen Y workers, who have been shaped by the interconnected world in which we live, will comprise 75 per cent of the workforce by 2025, and they see little sense in reporting to someone who just keeps track of their work. On the other hand they value learning from someone with deep skills – a master, not a generalist. Exponential growth in computing has now also brought the capacity to solve previously insoluble problems. In 2005 Frank Levy and Richard Murnane, two economists, described driving a car on a busy street as so complex that it could not possibly be mastered by a computer. Yet Google unveiled a small fleet of driverless cars only a few years later. Automation is expected to eat up between 23 and 47% of developed economies’ jobs, including highly skilled jobs such as accounting. Chartered Accountants Australia and New Zealand found that 46% of NZ jobs are at risk of automation in the next two decades. Digital disruption is, in fact, predicted to affect every market, every industry, every organization. What is New Zealand doing to prepare? Employers are not primarily results-focused: they often measure time over outcomes. Mobile work is unusual. The skills to manage and work in flexible teams are not common. And yet these are the skills needed to succeed in the future of work. The US, UK and Australia now talk about the future of work in business circles, conferences and the media like we talked about the global financial crisis. Meanwhile New Zealand appears to be quiet on the topic. Where is the conversation? Where is the thought leadership? There is a strong temptation to discount the discomfort that the emerging picture of the future of work presents. Certainly, it could turn out better or it could turn out worse, but ignoring the signs is foolish. In NZ, earthquake proofing is an essential part of life. We don’t know what size of earthquake might hit, but we aren’t willing to risk the consequences of not being prepared. Why would we not take a serious, investigative look at what the future of work means for New Zealand? We need to develop mastery and sophistication in both the STEM subjects – Science, Technology, Engineering and Maths and the art of being human – it is empathy and humanity that will have greater currency going forward. A core set of sophisticated professional skills will equip professionals to move around and between projects: collaboration, negotiation, project management, leadership, cultural awareness and technological skills. Lifelong learning needs to be better enabled – course delivery needs to adapt to people’s lifestyles and cater equally for working parents, older workers and the young. Innovation and agility need to be developed in schools, colleges and universities. With this will come an increased awareness and tolerance of the importance of what we could call ‘smart failure’ – learning from what worked and what didn’t work, adapting and continuing to learn. Failure is a necessary part of innovation, which needs to be encouraged, not discouraged. Benefits will need to move with the person, like the National Disability Insurance Scheme in Australia enables individuals to move around and not be stuck with one provider – in effect their benefits are mobile. The new security of work is undoubtedly also having better skills, networks and adaptability. Security of jobs is not about protection but agility. Our best approach to security of jobs in the future is to focus on developing innovative businesses – creating jobs is also our best chance of preserving existing ones. Our best response to the changing nature of work needs to include a focus on creating resilient organisations, which can connect with a wider, global talent pool, scale up and scale down, attract and retain great people and offer lifestyle flexibility so that it is easier for people to work and study simultaneously. Flexibility is a clear win-win and it increases workforce participation. Flexibility needs to be boosted in NZ businesses and organisations. Deloitte and Google found that large organisations can save $350,000 per annum on hiring costs alone through a flexible workplace technology policy. The main barriers to flexibility are attitudes and practices, but policies can provide leverage. New Zealand needs to learn from Australia, where the current Work Health and Safety (WHS) legislation is a powerful disincentive for remote work. Many leaders and managers are incredibly resistant to have their staff work from home, citing the WHS legislation. We need results-based work environments – not just because transparency improves performance but also because the process of establishing Key Performance Indicators is enough to improve productivity & contribute to firm-level resilience. Solutions to the future of work need to be simple and elegant, not burdening employers – so that NZ remains an easy place to start up a business. One thing of which we can be fairly sure is that the New Zealand workforce of the future needs to be smarter and more agile – investing heavily and cleverly in skills, taking advantage of the benefits of flexibility, developing innovative businesses and accessing talent from around the world. Thanks for this, it was a great read. I am one of those people that could not find an employer to be flexible enough to meet the needs of my work life balance and understand I would be able to produce outcomes far greater than if I was in the office, so I went and did something about it. I am now the Managing Director of my own Consulting company, which is starting to grow big enough to employ others that are working from home too. The interesting thing is that I work in the industry of VET that is focused on online, distant and mobile learning but it seems not future focused on the workers such as Trainers and Assessors. 90% of the providers that I have surveyed who deliver and assess online still require their staff to be HQ based (physically). I am actually working in NZ while I attend the DEANZ conference in Hamilton, but I actually live in North Qld Australia, I agree you need to be connected but aren’t we all anyway?